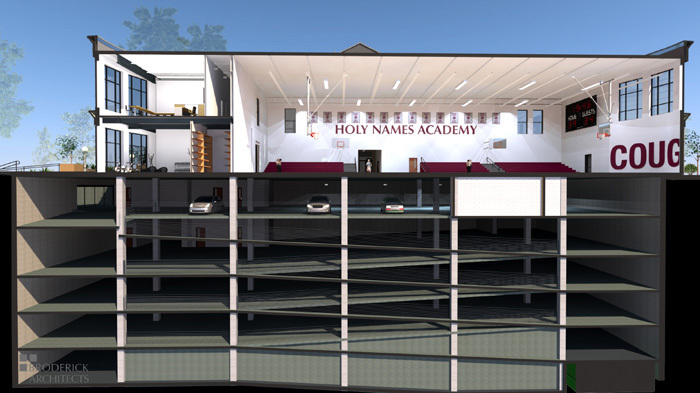 Images courtesy of Broderick Architects: Holy Names Academy plans to demolish its gym, so it can construct five levels of below-grade parking, and then build a new gym back on top. Residents are now appealing the city's approval of the project. Editor's Note: The SDCI land-use decision, appeal and neighborhood petition opposing the project can be found at the bottom of this article. The Seattle Department of Construction and Inspections cleared the secondary school for girls on Nov. 29 to proceed with its plans to develop the underground parking garage under its 30-year-old gym, which will be partially demolished to create a slightly larger two-story gymnasium in its place. There would be 237 stalls in the underground parking garage and another 32 on a new surface lot at 21st Avenue East and East Aloha Street; an existing 12 spaces would be removed. Holy Names principal Elizabeth Swift told MPT in February 2018 that the goal is to reduce the number of students and faculty parking in the North Capitol Hill neighborhood surrounding the school and better accommodate athletic and other events. The master use permit approved by SDCI does not require Holy Names to conduct an environmental impact statement, after an environmental checklist was completed and determined there would be no adverse impacts. Five exceptional trees on the site are planned to remain. A traffic study also found no adverse impacts around five intersections from vehicle trips to the new underground parking garage, according to the SDCI director’s decision, and that the parking provided would meet peak school demand. Several neighbors filed an appeal on Dec. 11 that claims the new parking structure will create additional traffic and congestion, is over scale and “will be a blight, especially on the north end of the property where the cherished, revered, and historic park will be paved with a parking lot…” They also worry about exposure to pollution during construction. The appellants are: Shannon Martin, Bill Gildea, Pat Griswold, Kate and Josh Pollock, Ron Friedman, Lili Sacks, Carol Hannum, Aze Hannum, Tim Anstey and Liz Nichols. The appeal claims Holy Names provided no collaboration opportunities for neighbors, even after the appellants provided a petition signed by more than 100 residents opposed to the school’s plans last April. A prehearing conference was held on Jan. 9, where it was agreed that appellants would provide final witness and exhibit lists by April 22 and city and Holy Names representatives no later than April 29. The hearing is slated to start on May 6. Case filings can be tracked here. Holy Names Academy was founded by the Congregation of the Sisters of the Holy Names of Jesus and Mary in 1880 and located in Downtown Seattle. Construction on the Capitol Hill facility started in 1906, and the school opened in 1908.